Who Says You Can't Play with an Axe? The Axe Game is one of the attractions in Branson that offers a huge fun experience, perfect for families, couples, groups, and corporate events. This 60-minute axe-throwing activity will let you learn how to throw, and ultimately, play with an axe and feel the lumberjack in you. This stress-relieving tournament begins by meeting your coach and listening to a safety briefing. When everybody is ready, you will be doing a variety of fun games and get ready for the competition. Every participant to this axe throwing tournament will be battling against each other, where everyone is determined to win the game. The Axe Game is a unique attraction in Branson where every axe thrower is sure to enjoy on this original axe throwing experience in Branson, Missouri. This axe throwing tournament is one of the best activities that you can experience in Branson. 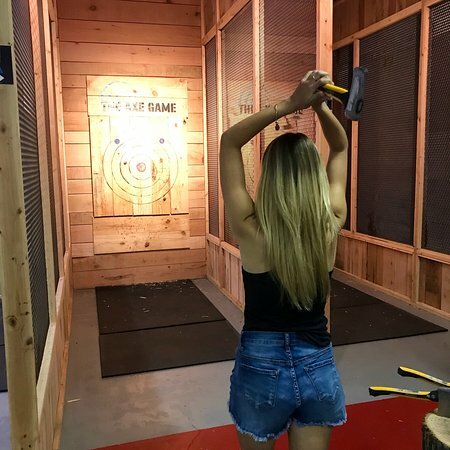 This axe game attraction should be on your list of things to do while you are spending a wonderful vacation in this favorite vacation spot in Missouri. This axe throwing experience can be booked online from home or on your mobile phone. Online reservation can be arranged at least two hours before your preferred scheduled game. As one of the newest attractions at The Shoppes at Branson Meadows, The Axe Game will ask visitors a simple question: hatchet or ax? This new game in Branson allows visitors to unleash their lumberjack, taking aim in one of nine throwing lanes and let the axe fly. When you start this axe-throwing game, you need to grip the axe and wrap your other hand around your dominant hand and across your thumbs, then take your stance. After gripping the axe, place your non-dominant foot slightly forward and prepare to raise both arms above and behind your head. After you bring the axe behind your head, step with your non-dominant foot while bringing your axe forward. When the axe is level with your eyes, throw it and then fellow through. This Axe Game attraction in Branson features nine lanes of axe throwing in a professional and comfortable environment and will be available for teams of two to twelve to reserve. Larger groups can reserve multiple ranges while smaller groups can take advantage of “free throw” lanes. Every participant to this game will find it fun and it will bring friendly competition. This amazing attraction in Branson is perfect for people with kids as young as 8, teens, and adults. So, if you are looking for a unique fun activity in Branson, axe throwing game is the one that you should play.